The Ithaca Falls Natural Area is a natural and cultural treasure. To celebrate its rich geologic story and industrial history, a team of community members created three new interpretive panels for the site which will be dedicated at a public ribbon cutting ceremony on Thursday, May 24th at 4:00 p.m. The project team included Margaret Hobbie, Realtor and former City Historian; Tom Knipe, City of Ithaca Deputy Director for Economic Development; Jeanne Grace, City of Ithaca Forester; and Sarah Fiorello, Interpretation Coordinator for Cornell Botanic Gardens. The project was also supported by the Tompkins County Chamber of Commerce, Historic Ithaca, The History Center, City of Ithaca Department of Public Works, Friends of Stewart Park, and City Historian Mary Tomlan. The signs were funded by the Tompkins County Beautification Program, which is part of the room-tax funded Tompkins County Tourism Program. The program will take place at the entrance to the Ithaca Falls Natural Area on Lake Street in Ithaca and will include remarks by Mayor Svante Myrick and County Legislator Anna Kelles at 4:00 p.m. Following a ribbon cutting, attendees will be invited to join a guided walking tour to explore the geologic events that shaped the gorge we enjoy today. The tour will depart from the entrance to the Ithaca Falls Natural Area on Lake Street in Ithaca to access trails and more waterfalls in Fall Creek Gorge. 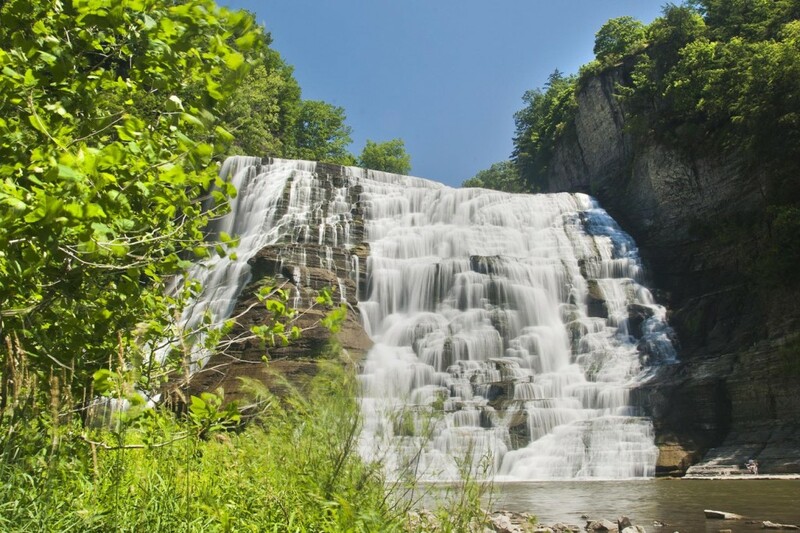 The route will take a spur trail to enjoy a scenic waterfall at creek level, cross a pedestrian suspension bridge, then return to the Ithaca Falls Natural Area. This moderately strenuous tour will be led by Cornell Botanic Gardens staff Todd Bittner, Director of Natural Areas, and Sarah Fiorello, Interpretation Coordinator, and will take approximately 60 to 90 minutes. People planning to join the walk should wear comfortable footwear and be prepared to climb stairs and hike a steep incline in a few sections.